I didn’t plan on hosting a meeting based on the National Day of Remembrance and Action on Violence Against Women, but I’m glad it happened. As part of a multi-branch group, I have trouble connecting the Violence Against Women program work that the older group does with my Sparks. This year, instead of trying to find substitute activities for the often too mature content, I planned to just do work from the Exploring and Experimenting badge. The Sparks were very quiet during the entire discussion of what a healthy relationship is, and what to do if you feel unsafe. When we separated from the group to do our own activities, I took a minute to ask them what they’d learned from the Brownie leader’s talk. I was surprised to learn that they were silent because they didn’t know what a relationship was. You have relationships with your boss, your friends, your teachers, your girl Members, and many more people who also have relationships with you. Most of us take the healthy relationships we have for granted, and also don’t remember a time when we didn’t know what a relationship was. How could I explain this to a Spark? Eventually, after a couple botched attempts to explain myself, a smart Spark piped up to help me. “I think it’s like, you want to help that person, and you care about what happens to them,” she explained to me, and then she told me that when you’re being nice to someone, you follow the Golden Rule. When asked what happens when someone’s being mean to you, all three of them gave different answers. One declared that meanness makes her sad, another that it makes her angry enough to want to be mean back, and the third that she usually just cries and that’s it. Shortly after, I concluded our discussion by asking them to draw pictures of what they had learned from that night’s talk. The drawings that came out were beautiful renditions of rainbows (who love everybody and are happy all the time), people being nice to everybody, and one girl’s carefully written sentence “You can go to them [shelters] in the middle of the night.” To my Sparks, the definition of a relationship became the love you show that person. 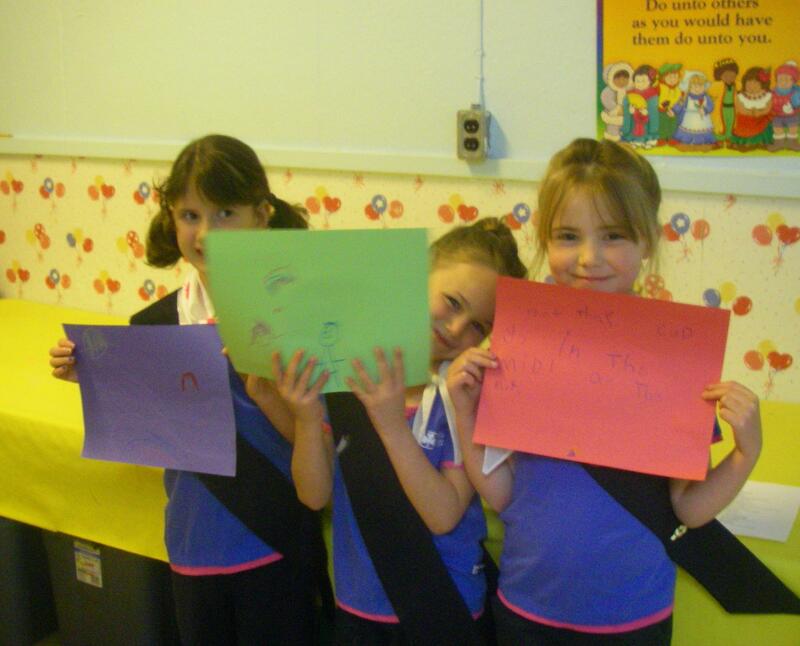 By guest blogger Guider Shannon, 1st Lennoxville Guiding Unit, (QC) and Lennoxville District Public Relations Advisor. This entry was posted in Awesome Activities and tagged sparks, special days, violence. Bookmark the permalink. Good Job on a tough tough subject, I also do Sparks and I do this challenge EVERY year, I use different versions every year, we talk about bullying, teasing, violence, what would you do if…self defense techniques, telling a trusted adult… it’s all good, it empowers the girls and helps them think outside the box. Let’s them know Violence is not acceptable.